Update 21 June 2009: The Highlands community came together to celebrate the Map! (see Event below). 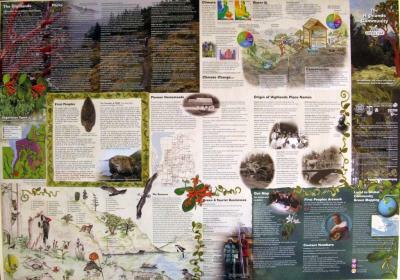 Update 17 May 2009: The printed maps have arrived at UVic Geography and will soon be delivered to Highlands residents. Update 30 October 2008: Printing - We are doing the final revisions to the Highlands Green Map and it goes to the printer next week! We will post a picture of the map soon. 4 July 2007: First Meeting - Maeve, Ken and Charles visited the Highland Community Association, Community Mapping Project Team on Wednesday. We gave some information about our past community mapping projects and some of the things we could assist with. Highlands have lots of enthusiasm and lots of cartographic skills. Two of their members use OCAD and ESRI products. 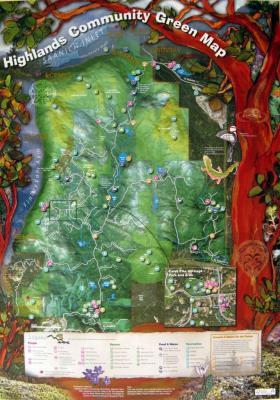 The main goal set during the meeting was to have something for Highlands residents to see and "map on" for the Highlands Fling, 9 September 2007.